United Nations is a proper noun. United Nations is (1) an organization of independent states formed in 1945 to promote international peace and security. 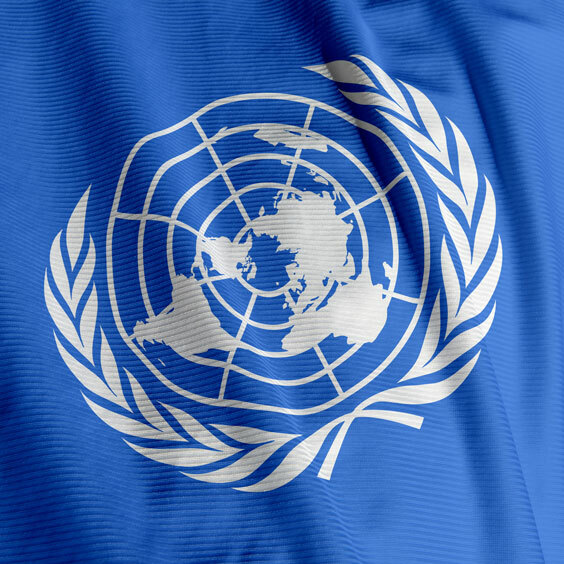 The following articles provide more information about the term United Nations. This is the website for the United Nations, located in New York City. The UN was begun in 1945 with the goal of maintaining world peace and to provide a forum for countries to work together on global problems. There are 192 member nations in the General Assembly, and 5 permanent members of the Security Council of which the U.S. is one, plus 10 non-permanent members with one year terms. UNDOC, headquartered in Vienna and established in 1997, is a leader in the fight against illicit drugs and international crime. On the website, users can find out about UNDOC initiatives, news, publications, research, treaties, conventions, and legal affairs. There is also a link to the World Drug Report for 2007 and to a new magazine called Perspectives. Job opportunities are also listed. This is the website of the secretariat of the UNFCCC. It is maintained to support arrangements for meetings organized under the Convention, to transmit official documents and reports, and to assist in other types of relevant communication. It also serves the Kyoto Protocol. The website provides background and projects of the UNFCCC, information about publications, and more. UNESCO, the United Nations Educational, Scientific and Cultural Organization, was founded in 1945 as a specialized United Nations Agency. UNESCO works on such problems as worldwide literacy, education, the elimination of poverty, and helping nations reach sustainability. The website is the source for finding out about their projects, publications, and history. UNICEF was founded in 1946 by the United Nations to help the many children facing famine and disease after WWII. UNICEF's mission is to help children wherever they need it. It provides housing, food, and clothing. It promotes education, especially in places where it is denied to girls. It is involved in health care issues and immunizations. The website describes UNICEF's history and projects. The World Intellectual Property Organization, established in 1967, is a specialized agency of the United Nations. It is dedicated to developing a balanced and accessible international international property (IP) system. The website has links to patents, trademarks, copyright, and more. Also on the website are resources for delegates, journalists, students and others, plus most requested info. The following articles provide recent United Nations-related news. Radio Liberty. Wednesday, 17 Apr 2019 09:10:38 +0000. Voice of America. Monday, 15 Apr 2019 20:56:32 -0400. More than 3 million books were destroyed when rockets hit ministry of education buildings during fighting between rival government forces over the Libyan capital Tripoli, officials and the United Nations said on Monday. Reuters. Monday, 15 Apr 2019 11:18:44 -0400. Yahoo. Thursday, 11 Apr 2019 13:08:34 -0400. Voice of America. Thursday, 11 Apr 2019 10:44:46 -0400. Pompeo says Venezuela's Maduro is a "true threat" to the U.S.
CBS News. Wednesday, 10 Apr 2019 18:21:10 +0000. Fox News. Wednesday, 10 Apr 2019 14:43:58 GMT. Canadian Broadcasting Corporation. Monday, 8 Apr 2019 18:07:15 EDT. The Latest: The United Nations health organization has decried the killing of 2 doctors who died treating civilians amid fighting between armed groups in Libya's capital, Tripoli. ABC News. Monday, 08 Apr 2019 11:28:12 -0400. The following digital image illustrates the term United Nations.